Infiniti came to Canada back in1989 as a purveyor of slightly fancier Nissans. Nothing wrong with that sort of repackaging but the brand lacked any really unique personality. All that changed in 2002 when the G35 came to showrooms. That car was the harbinger of good things to come. It brought to the table near 50/50 weight balance in a rear wheel drive car that was powered by a delightful V6. The sedan was underpinned by the same chassis as the Nissan 350Z, and the benefits of this decision were nimble handling blended perfectly with comfort. That was the way Infiniti came to be thought of, even when they brought us CUV’s like the FX35, the recipe didn’t change, nor should it have. As a brand Infiniti had just matured into confident adulthood proud of whom it was and the vehicles it offered. 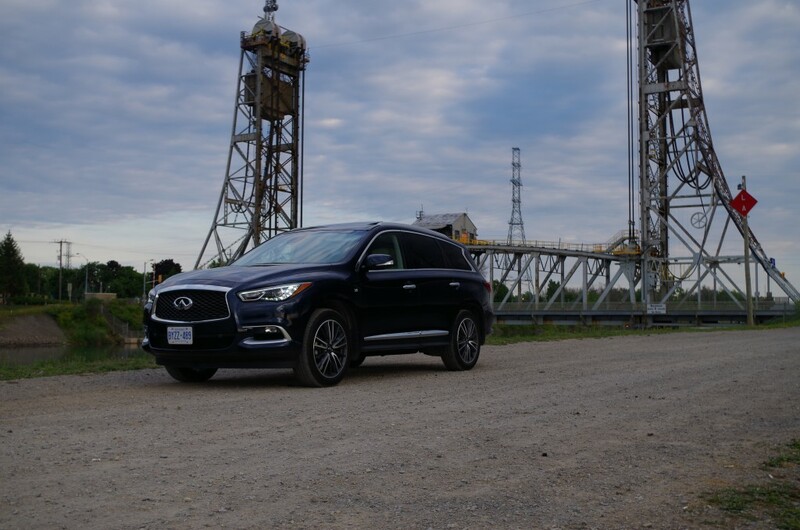 I drove the 2016 QX60 AWD recently and was expecting the usual joyous driving dynamics I have come to expect from the brand. However that was not the case. It appears there is a little too much of the Nissan Pathfinder lurking in the DNA. 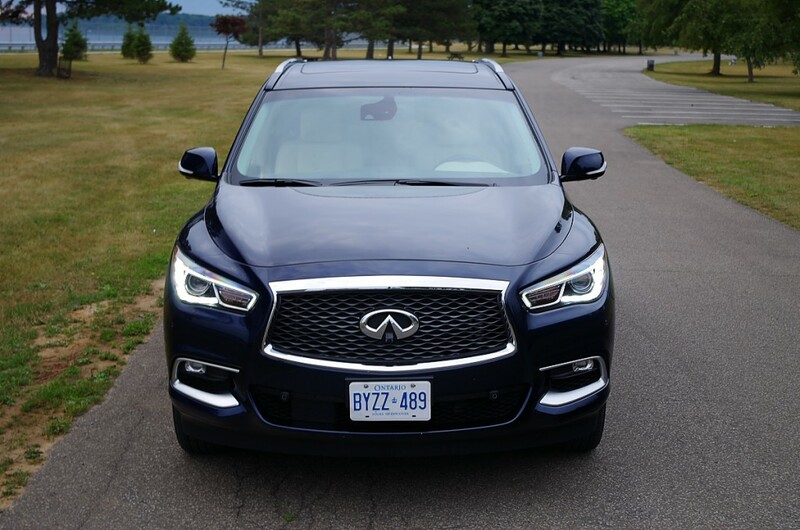 Considering this is a CUV, and a fair size one at that, the QX60 is rather handsome. The lines flow gracefully and lend a sense of athleticism. The exterior has received a few alterations to bring the model up to date with the rest of the models in the line-up. The new double-arc grille is complemented by the HID headlights, new LED running lights and turn signals as well as new LED fog lights. The model seen here had a front sliding moon-roof and a rear panoramic roof which adds to a light and airy feeling inside. Acoustic glass was used to help prevent any unwanted noises from disrupting your passengers while they are communing with nature peering out the roof at the billowing clouds and passing trees. The interior is a very versatile space with lots of room for people and things. With the electric folding third row there is room for 7. The second row seats are attached to sliding tracks which allow you to adjust the amount of leg room for the third row meaning an adult can sit back there. The second row seats move very easily to allow access to the third row by means of a handle on the side which tilts the seat back forward slightly and flips the seat bottom up to allow the assembly to be slide up to the front seat back. If it is cargo volume you need the seats will also fold leaving a level and large area. The seats themselves are well padded and comfy. 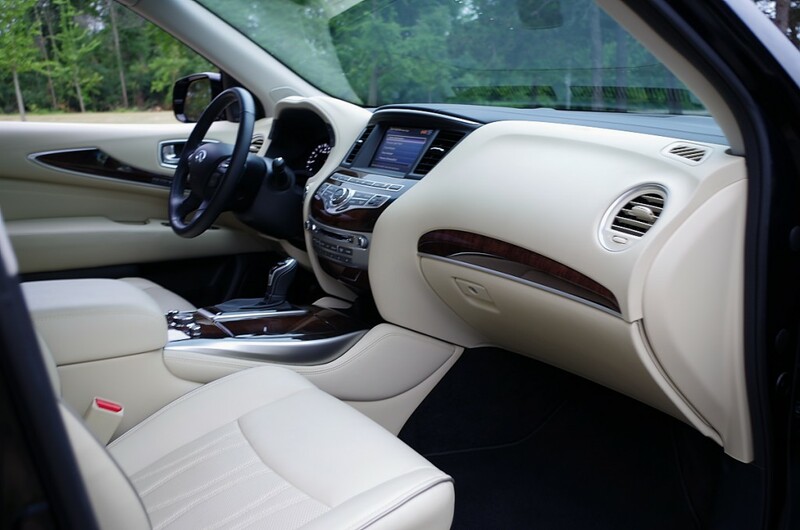 The front row feature heating and cooling, the second row can be heated and the third row has access to USB charging. 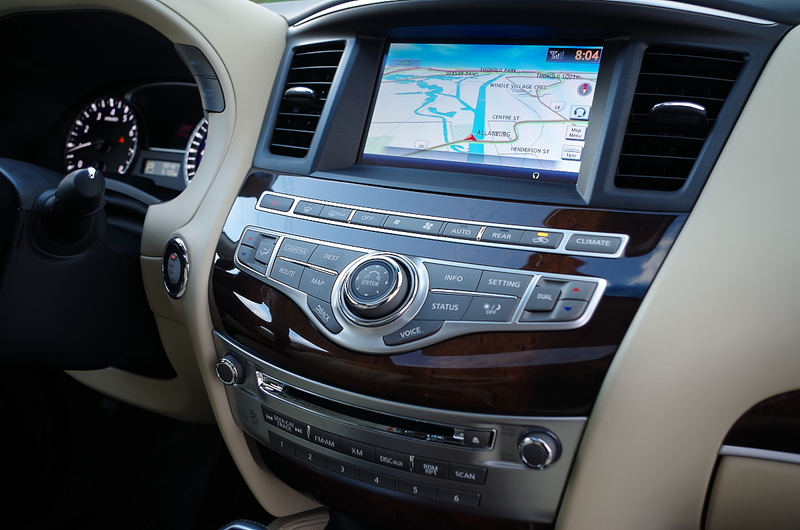 The dash layout is attractive with easy to reach controls and a simple enough infotainment system. The new two screen setup found in the Q50 would have been a treat, but hopefully it works its way into the model in the next round of tampering. There is one unfortunate oversight though; no analog Infiniti clock. There is abundant use of leather, everything you touch is soft and made of nice materials. The colour scheme in my tester was a bit confused with one colour to many, other than that it is a nice place to pilot the CUV from. There is an extensive list of available electronic wizardry. This exact unit featured the premium package, the deluxe touring package and the technology package. Rather than rewrite the brochure I will just mention a few of the highlights from these three groups: Bose Surround with 15 speakers, Intelligent cruise, Intelligent braking, Predictive forward collision, 20” aluminum rims, navigation and around view monitoring. These three groups added $14,385 to the list price, so choose wisely. This is not a small vehicle, nor is it particularly light. However it is an Infiniti so it must be fun to drive, right? Unfortunately not; the problem for me is the lack of feedback sent to the driver and somewhat dull performance. The steering while direct and quick to respond delivers absolutely no sense of connectedness and is very light at speed and a touch heavy in a parking lot. As a result of this lack of communication I found myself wandering from side to side in my lane. Graciously the vehicle had a lane departure warning system that was doing its best impersonation of Morse code on one twisty back road excurision. Then you have the CVT which manages to spoil what is known to be a tremendous engine with no small amount of droning. The suspension has been made firmer in an effort to provide a more enticing drive, but it still manages to exhibit a lot of body-roll in the bends and dive under braking. This would make you assume the suspension is soft if it were not for the harsh way it interacts with potholes. In a Nissan Pathfinder this would not even be an issue for me as the ride is very comfortable on smooth roads and gravel roads alike. The thing is when I think of every Infinity I have ever driven or been driven in they all felt special. They handled corners with little to no roll, the engines offered up gobs power and the sort of noises that soothe the soul. The QX60 has none of these traits. 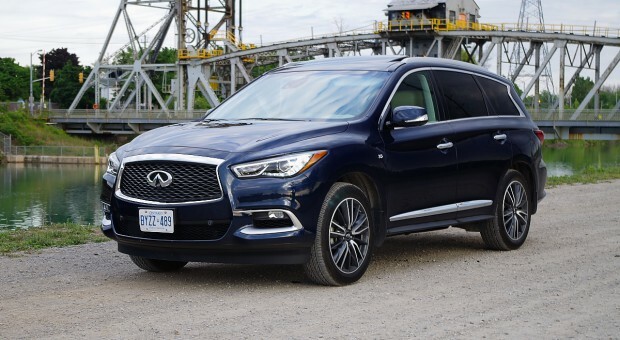 It sort of reminds me of the GMC Suburban’s and Yukon’s of the 90’s in that it feels large, slow and floaty; that is fine for a boring family hauler, but not for an Infiniti. 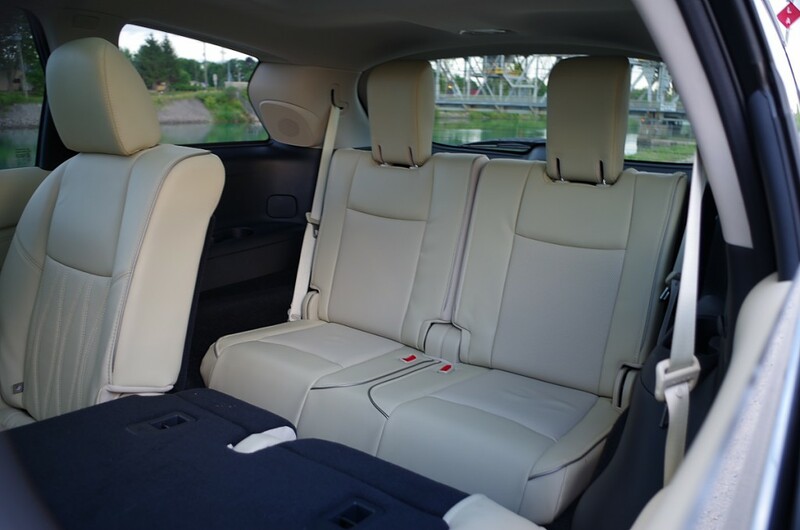 It is possible that I am being far too fussy but this vehicle is supposed to compete against the BMW X5 a vehicle that has stimulating ride characteristics and the Volvo XC90 a vehicle offering an almost transcendent balance between comfort and handling. One thing I will give it credit for is the silence while driving. Being that the focus of this vehicle is more Camry than Camaro a lack of outside noise or any noise at all is a great trait. It is so quiet that I could actually hear the actuator that applies the brakes while the adaptive cruise is turned on. You get an absolute sense of isolation and disconnection from the world around you. If you have a high stress job and an equally frustrating commute this could be reason enough to consider one of these vehicles. Power is provided by the venerable 3.5L VQE engine. In this vehicle it outputs 265 hp and 248 lb-ft of torque. This power is sent through a CVT and on to an AWD system. Thanks to newly designed active hydraulic engine mounts no vibration and little noise is transmitted into the cabin. The driver can select from among 4 driving modes that will alter throttle response and the way the CVT delivers the power. In Snow or ECO the throttle pedal seemed to almost resist being pushed and acceleration was soul crushingly slow. Normal was my choice for the bulk of my time as it accelerated well enough to keep up with traffic without wasting fuel by keeping the engine at higher revs like Sport mode did. Power delivery is very smooth and further enhances overall comfort. The official numbers are 8.9L/100km highway, 12.2L/100km city and 10.7L/100km. I averaged 10.9 L/100 km so I can safely say the economy is as advertised. The one down side is the engine prefers Premium fuel. There is also a Hybrid version which uses a Super-charged inline 4 cylinder that displaces 2.5L. The combined output for this system is 250 hp and 243 lb-ft of torque. According Natural Resources Canada the Hybrid should return 8.9L/100km city; 8.4L/100km highway; 8.7L/100km combined. The 2016 Infiniti QX60 is a very nice CUV. It delivers a comfortable ride that is best suited to smooth roadways with few bends. The power is adequate but the vehicle cannot hide its weight when pushed. 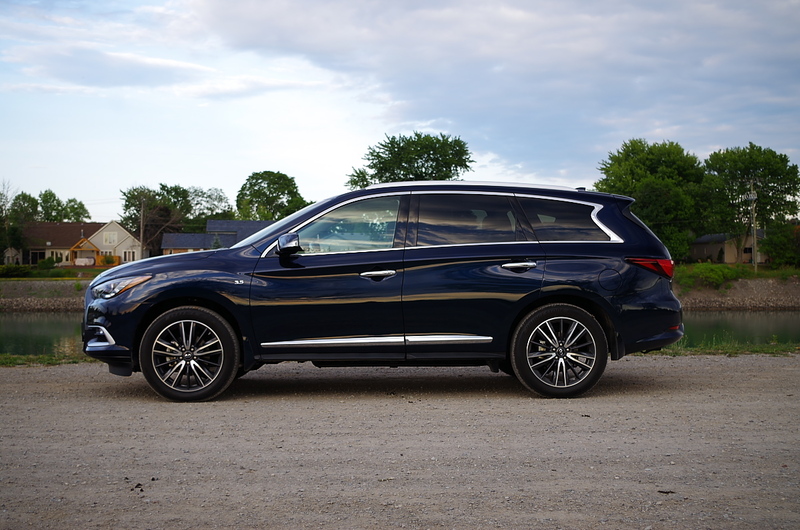 It is my opinion that this vehicle is tailored to someone in the market for a Nissan Pathfinder but who craves a little more flair and luxury, but isn’t looking for out right performance. 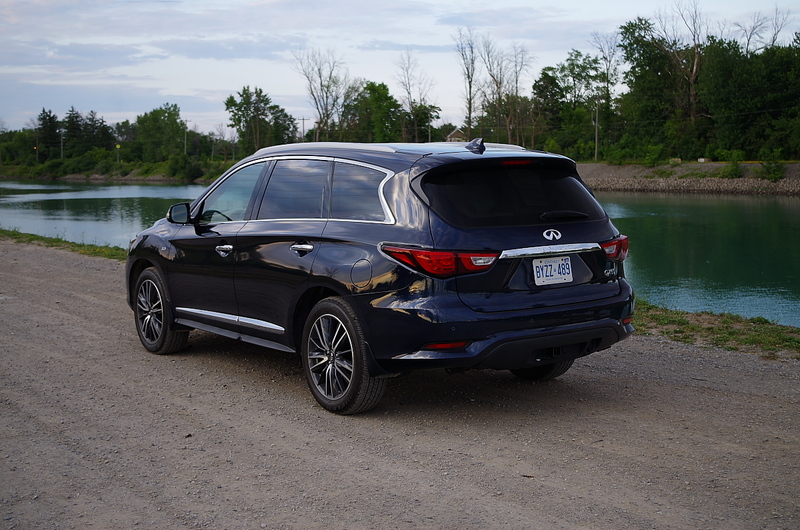 The QX60 is a good CUV but it falls short of being an Infiniti.